The lessons of life flow like toothpaste from a uncapped tube, luckily without hampering the flow of some refined farce in this innocuous, cute if at times grating confection blending humour with the supernatural element. For those who have been missing him, Abhay Deol gets to be in nearly every frame of the film. It’s called making up for lost time. And that (time wasted time gone) is one of the underlying themes of this fair little concoction of farce and fear. It could have been much better if only it didn’t set out to wag fingers at the imbalances in life. The film has some lovely ideas on redemption and salvation that it throws forward willy-nilly. The humour, specially related to a bully who loses his aggression to a road accident, is well-aimed. Abhay Deol’s deadpan drollery (which makes him look like a cousin to Ajay Devgan rather than Sunny Deol) serves the plot well. Patralekha makes a likeable spirit. But playing ghost also keeps her invisible for a large part of the film. You wish there was more of her. Come to think of it, you wish there were more of a lot of things in this ghostly satire. You also wish the film didn’t labour so strenuously to throw forward the lessons of life which wouldn’t need to be served on a platter if the story had been written with more sensitivity. 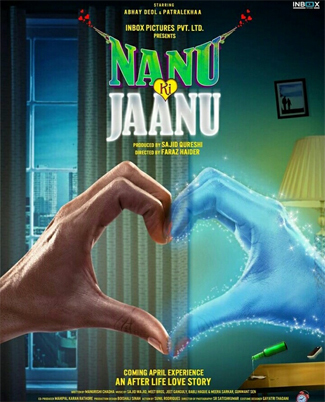 Nonetheless Nanu Ki Jaanu compensates for its pale notions of redemption with lots of voluptuous Punjabi-styled humour, that includes a female ghostbuster in a hip-hugging saree and with a designer handbag, that never lapses into vulgarity. It is a fun to watch while it lasts, though you would find yourself wondering why it couldn’t have been better assembled and packaged.